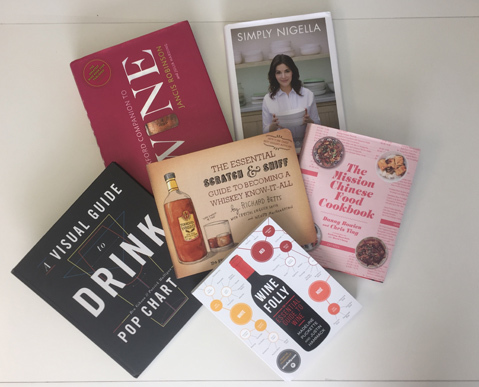 It’s last minute gift idea time, and if you have friends or family that love wine, whiskey, or good food, here are some books that will aid in your mad last-minute rush. The Essential Scratch & Sniff Guide to Becoming a Whiskey Know-It-All: Richard Betts, who brought you the Essential Scratch & Sniff Guide to Becoming a Wine Expert, delivers a new tongue-in-cheek guide to this brown liquor. Full of quotable factoids and comical illustrations, it also will bring back memories of scratch ‘n’ sniff books of your youth. The Oxford Companion to Wine: Now in its fourth incarnation, Jancis Robinson’s book is the one to own if you have any sort of interest in wine. Read everything in here, and you’ll be well on your way to becoming an expert. Plus, reading an encyclopedia is a nice way to go retro in today’s online wiki world. Wine Folly: Wine-blogger Madeline Puckette created this modern take on wine education, which is full of useful diagrams, graphics, and pie charts explaining grape flavors. This is a perfect gift for someone who’s just getting into wine and wants to further their knowledge. A Visual Guide To Drink: Patrick Mulligan’s coffee table book uses creative graphics to explain everything from the process of making sake to the different tequila styles. It’s heavy on the beer and wine entries, but also has an explanation of all the popular spirits. There’s even a section of fictional beers from movies, TV shows, and novels. It’s perfect gift for those perusing types, as it’s designed to pique curiosity. Simply Nigella: Nigella Lawson steps away from her usual all-out indulgence to venture into healthy territory, but without cutting flavor. Recipes include butternut halloumi burgers and vegan chocolate cake, but the best chapter features quick and easy “bowl food” ideas such as Indian spiced shepherd’s pie, split pea soup with chilies, ginger, and lime, and Thai noodles with cinnamon and shrimp. The Mission Chinese Food Cookbook: Danny Bowien’s famous San Francisco restaurant started as a pop-up inside a traditional Chinese restaurant, and this book explains his journey to becoming one of the country’s most well-known chefs. His recipes draw from Korean, Japanese, and American food, including dishes like Salt Cod Fried Rice, Hong-Kong-Style Crispy Pork Belly, and General Tso’s Veal Rib. This is good for anyone who’s a tinkerer in the kitchen, as Bowien prides himself on being just that.